All Lake Mathews homes currently listed for sale in Lake Mathews as of 04/25/2019 are shown below. You can change the search criteria at any time by pressing the 'Change Search' button below. If you have any questions or you would like more information about any Lake Mathews homes for sale or other Lake Mathews real estate, please contact us and one of our knowledgeable Lake Mathews REALTORS® would be pleased to assist you. "Come explore this 13+acre property estate with 2 parcels included in the sale. 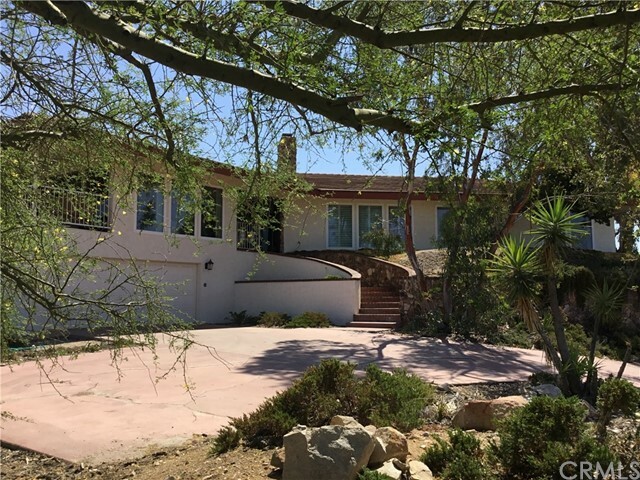 Secluded at the top of the hill is a 3,550 sqft ranch style home which includes a MIL quarters as part of main house. On same parcel there is a detached Guest House with 1,200 sqft featuring 2 bedrooms & 2 baths. This estate has spectacular breathtaking views of Lake Matthews and hiking trails surrounding the property. Main house includes: tile floors, vaulted ceilings, Dual Pane Windows, a 3 car garage & detached 1 car garage. The grand living room is a beautiful entertaining space with vaulted ceilings, a brick fireplace, a lovely bar area, and patio access. 2 private bonus rooms adjacent to the living room offer flexible space opportunities that can accommodate an office, a bedroom, a living room, a dining room, or a den.3 bedrooms and 2 full bathrooms are near the master bedroom. On the opposite side of the house is a large mother-in-law suite featuring a master-sized bedroom with kitchen, 1 full bathroom, and a private entrance. 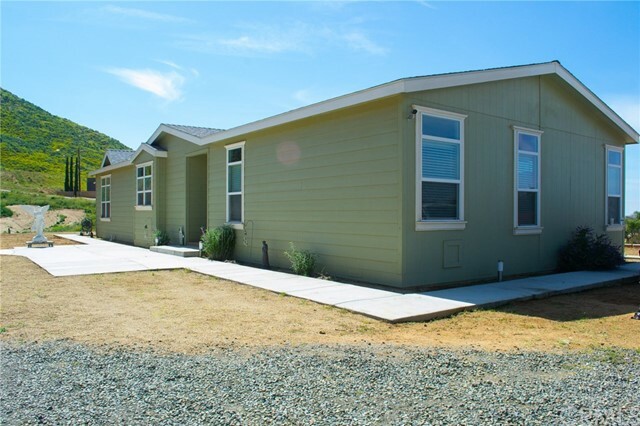 The Guest House at the beginning of the driveway features 2 large bedrooms, 2 bathrooms, spacious living room, newer kitchen, ceramic tile throughout, and central A/C. This property is located near the edge of the Lake Mathews Estelle Mountain Reserve with beautiful scenery and multiple hiking trails. 2 PARCELS INCLUDED IN THIS SALE: APN# 286-100-010 DESCANSO(2 homes) & APN# 286-230-021 OFF BRIAR PLACE (Vacant Lot)." "Privacy with endless views! This home has limitless possibilities. This 4 bedroom, 5 bath home with built out basement boasts over 4,508 sq. feet of living space. In every room you have unobstructed panoramic views of the surrounding mountains, lakes and city lights. The downstairs living space has a formal living room, dining room and family room with fireplace. The kitchen has a large island, ample cabinet space, and a large breakfast area that could easily seat six. Adjacent is the laundry room, a full bath and a downstairs bedroom. Upstairs is the master suite with a large sitting area and fireplace. There is a huge walk-in closet and a large master bath. The suite has two sky lights and a private wrap around balcony to enjoy morning sunrises or evening sunsets. The other two bedrooms are generous in size and one has its own fireplace. The basement has its own entry and is fully built out with new paint, new carpet and a full bath. This could easily be a separate office, mother-in-law s quarters or extra income as a rental. Outside you have endless opportunities with the additional two parcels. There is plenty of space for RV parking, toys, or even a barn for your horses. PROPERTY INCLUDES TOTAL OF 3 PARCELS - APN #289160033-4 (5.39 Acres With Home), #289160031-2 (7.81 Acres), #289160032-3 (4.60 Acres). SOLAR IS PAID IN FULL. There are (3) Wells with (1) 5,000 Gallon Tank. Hot Water Heater is both Electric & Solar." "This home has everything!!! This single-story house is 6 bedroom 3 bath, with a detached guest house that is 2 bed 1 bath with a kitchenette for a grand total of 4,396 sqft. It is beautiful horse property that sits on 1.86 acres that offers a salt water pool and spa that fells like a private oasis. The backyard has a round pen, tack room, hay barn, and two lower horse corrals along with fruit trees and easy access to the HOA maintained riding trails. The RV garage is currently used as a home theater. There is easy driving access around the side of the home to get in and out of the backyard. The pool has solar heating panels on the roof to extend your use during the year. The large back patio has an Alumawoood cover stretching the length of the house. The irrigation for the backyard is on a drip and sprinkler system and is fed from the well. The house is on city water, propane and septic. The kitchen has granite counter tops, lots of cabinet space, and a walk-in pantry. The house has 10-foot ceilings. It offers ceiling fans in all the bedrooms, kitchen, and living room as well as a whole house fan for the cool nights. The windows are dual pane and have shutters. The house is very well maintained and truly has everything you can ask for." "Privacy & views, views, views galore! It's all downhill from here! Literally. Elegant custom home sits on TOP of the mountain with complete 360-degree views! Complete privacy, well except for the Hawks. Stunning views of mountains, hills, skylines, lake, sunsets, city lights & more. Add to that a completely fabulous single story, custom home with a fantastic pool & fountain behind security gates & you're home!! The pool plaster has just been completely re-done rendering it brand new. This custom home has lots of living space with a master suite, bonus room & a step-down living room (off the family room) with a beautiful rock wall fireplace. Every room has a gorgeous view! There are built-in wall units, a bonus room that is easily converted to a 4th bedroom if needed, full laundry room with sink and cabinets, a newer custom carport adds to plenty of parking and the kitchen has a utility closet plus a full-size pantry with custom shelving and pull-outs. Bathrooms around every corner too with a count of 4. Pool and fountain area have nice seating spaces to enjoy your time. There is gorgeous floor tile & carpeting so rich you may decide to sleep on it instead while enjoying your view from any room. Lake Mathews is a vast, wide open area. 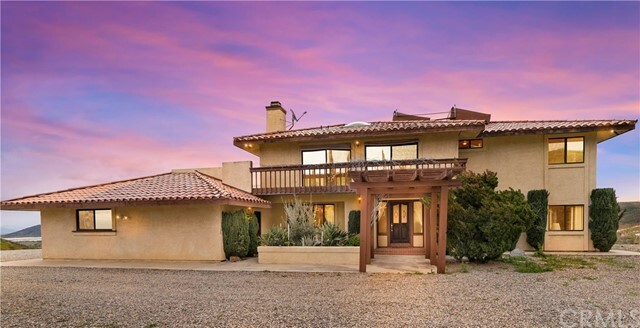 There are horses, trails, bird watching, shopping nearby and while it will have a rural, feel; your peace of mind will only be enhanced knowing that it sits between Corona & Riverside with all the big-city amenities you may enjoy. :-)"
"Have you ever dreamed of owning a home in Lake Mathews Estates? Now is the time to check out this priced-to-sell charming, custom home with 4 bedrooms, 4 baths, newly remodeled kitchen and bath off the den. Remodeled custom kitchen features soft close doors and drawers, Kenmore Elite, convection and self cleaning oven combination, Bosch dishwasher, LG microwave and easy to clean beautiful quartz counter-tops. Newly remodeled bath is true to earthy tones and materials with a frame-less shower door. Laminate flooring throughout with tile in baths and kitchen. 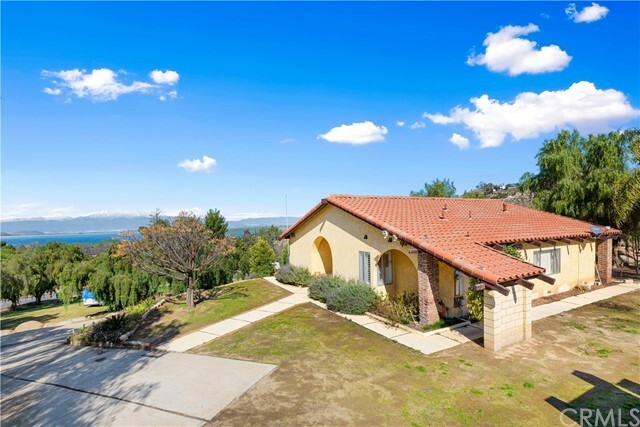 Custom Spanish/Mediterranean style home is situated on a lot just under two acres, plenty of space for an RV, toys and animals with plenty of parking. Mature pepper trees surround the property with fruit bearing orange, lemon and peach trees. 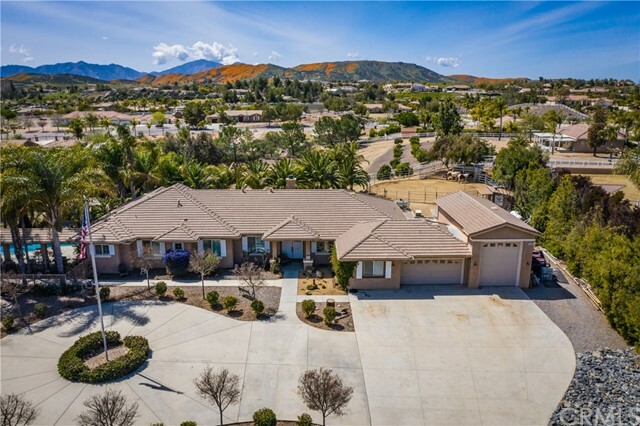 Spectacular view of Lake Mathews, city lights, and surrounding mountains will invoke a sense of well-being every day with its peaceful atmosphere. Great patio deck off the kitchen and dining room will inspire you to be thankful for the stunning beauty surrounding you. Brick patio surrounds the back of the house. Two fireplaces, one-of-a-kind lava rock in the living room and brick in the den will keep you warm on chilly nights. Both are wood, also have a gas hookup for real warmth! 10 minute drive to shopping in Corona and Riverside. No HOA. Corona Norco school districts. 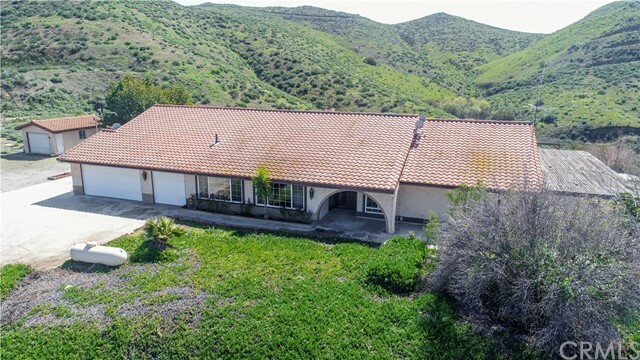 Located between 15 freeway and 215 freeway near easy flowing Cajalco Expressway"
"Looking for Country style living but still want be close to everything? This is the property you've been looking for. Lake Mathews is a wonderful area, that is still mostly undiscovered, it is centrally located between Riverside, Perris and Corona. The property itself is situated on the south east side of the lake. Homes in the area are generally all custom builds. The shopping and entertainment center of Dos Lagos in Corona is about 10.7 miles away. The property itself features a newer construction home and a sizable lot of 2.51 acres. This would be a perfect opportunity to bring the toys and equipment. The majority of the land is flat and usable, with the home sitting on the top of a small hill. The nighttime views are very pleasant offering sights of the city just on the other side of the Lake. The inside of the home is very modern and quaint. It'd make for a perfect place for an evening in. It features Four bedrooms and two bathrooms. The master bedroom is large and has a standing shower and separate bath tub. The center of the house flows into a large entertainment area and an open kitchen perfect for guests and parties. The open floor plan makes good use of the space which leads into the backyard. Included in the sale is a conforming separate two car garage and storage container by the garage for added storage. There aren't too many houses like this that come on the market. Property may be eligible for USDA Financing. Note red storage container not included in sale."